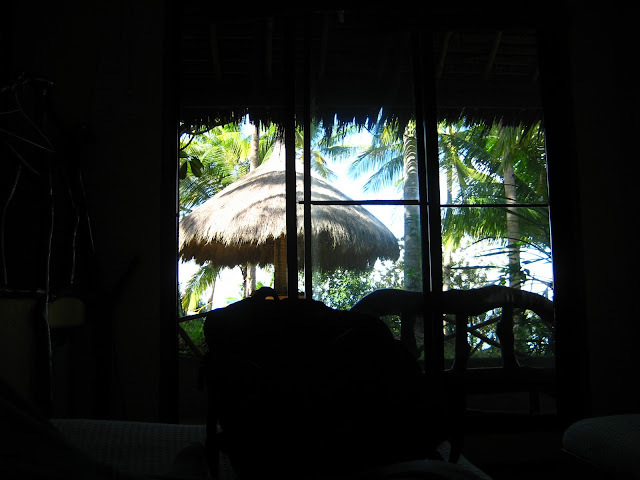 Getting accommodations around the island of Siquijor is particularly tricky. It's a gamble, if you know what i mean. Finding the right one for you is only possible once you get there. I have researched about where i will stay for weeks, even asking random people where is the best place to stay in Siquijor. To play fair, i narrowed down my choices to four: Coco Grove, Danish Lagoon, Casa De La Playa and Villa Marmarine. Although the first three beach resorts provide comfortable amenities with spacious rooms and mind you, with style. I had to decide the best place to stay considering i am traveling alone. I don't mind splurging a little bit if it meant an awesome accommodations for me, but who needs a casita with a three-bed room, an office desk, a large patio, and a swimming pool, when the rest of the my days will be spend outdoors? I hopped on to this blogger who wrote about Villa Marmarine. Googled it, and found the website. MAR means sea in Spanish, and in English MARINE also means sea. Local people call Ms.Marie Harada “Mar Marine” (Mar is the honorific title of an older woman), a friendly and respectful person. Ms. Marie Harada designed four cottages and a restaurant. VILLA MARMARINE opened in the Siquijor Island in July 2005. The hotel has a homey atmosphere and it is managed by Japanese. This is the best place for the families and for visitors who plans a longer stay in the island. We have the most beautiful beach in Siquijor Island though it is yet not been recognize as a sightseeing spot, and also the best location for a person who wants to spend his moment in serenity.It is a small resort with four cottages and restaurant that had just started. At night, brilliant fireflies fly over the cottages and some are seen in the seashore and the wonderful starry sky that welcomes you. The site provided me with information i needed, facilities, room prices, accessibility but what sold me to staying here is the resort's vision for the young kids of Siquijor. I found out that 10% of what you pay for accommodations goes to the construction of classrooms, water supply and of course, education. I booked for a few nights right away. Although, the only room available was a backpacker room, i settled for that anyway. I knew this was the main purpose of my trip to Siquijor. I have seen the work Dagman is doing and i commend his devotion to helping the poor kids of Siquijor have a bright future ahead of them. I value his sincerity, and i appreciate his selflessness. The people who work for him at the resort are students and through this resort, more and more youth are given the opportunity to help out their families. I've seen many little kids in Siquijor who i am pretty sure aren't studying, and i wonder how will they be in let's say, five years. I blogged about this, and starting from this trip i will make sure that wherever i may go, i will try my best to extend whatever help i can give to those who are needy. This has become my main purpose for traveling. 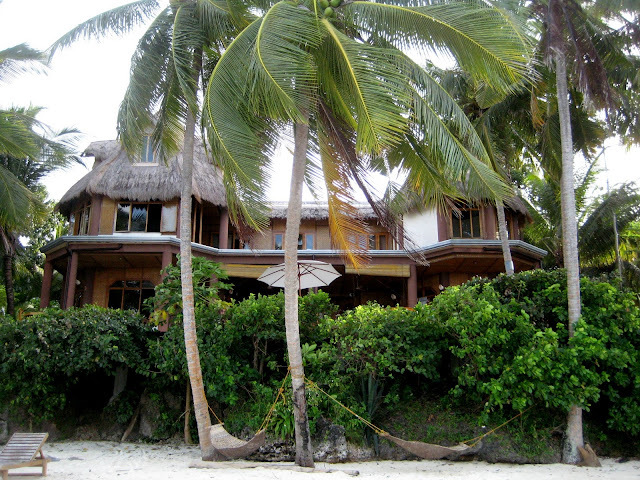 If you're planning on making Siquijor your vacation spot, do stay in Villa Marmarine! And if you have anything: children's clothing, food and milk, educational toys, books, notebooks, pencils, musical instruments, old stereo units, it would be greatly appreciated by the kids. I have discovered the need, and if we can only spare a few extra clothing or just by staying here at this resort, we can make a difference in the kids' life. I met the main man and his lovely wife who were eating already their lunch. I finally met Max, the guy i was calling to book my room. He showed me my room. Although up until now, i am unsure why i was transferred to spanking room, it was plain lovely. This particular room has a view of the hills which is overlooking the sea. Its relaxed atmosphere is definitely conducive to sleeping and relaxing. Sometimes i would watch video clips on my iPod, other times i am sitting in the lovely wooden bench and trying to organize my thoughts. Most of the time, i do nothing around here which was what i really wanted. The rooms are clean and rustic. This one has a huge room with a few steps up leading to the toilet and shower room (separately). There's an electric fan, a television set, and separate terrace. 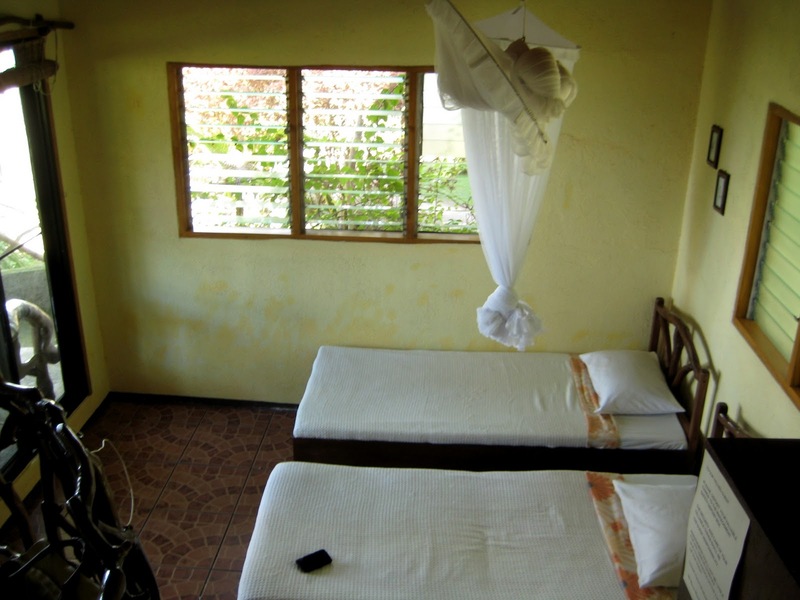 The beds are comfortable with a large mosquito net, as if you need it. Most of the time, i am just chilling in the hammock and watching as hours pass by. I wake up in the morning, and this was my breakfast. I meditate, pray and think about life and its many possibilities and impossibilities. I've realized more here than ever before. Happiness isn't about a $1000 purchase or a 50% increase in your wage, it's about living your life with moments you can never forget. I remember Max saying sorry that the room i got wasn't the best one. I told him, it was perfect. After my motorbike island tour, he told me i could transfer to the main guest room. Huh? It's a huge room with five beds, an office desk, a couch, cabinets, television set, refrigerator, and was located in the main house. The shared shower room has a bath tub which you can use anytime with an amazing view of the ocean. You can't beat that! A few hours after that, a dutch guy from Cebu arrived. He wanted to stay in Villa Marmarine so badly, since it's fully booked, he'll just pitch in a tent for the night. I told the lovely concierge that he can stay at my room. I'm used to hosteling anyway. It's five beds, and i am just alone. A company would be nice. I ended up having funny and outstanding conversations with two dutch guys, a colombian, two american girls, and later on with a family and mother-daughter from Sweden. It was a good chat, mostly about future travel plans, deep-sea diving, fireflies, gateball and of course, a Siquijor trip wouldn't be complete without the talks of witchcraft and sorcery. 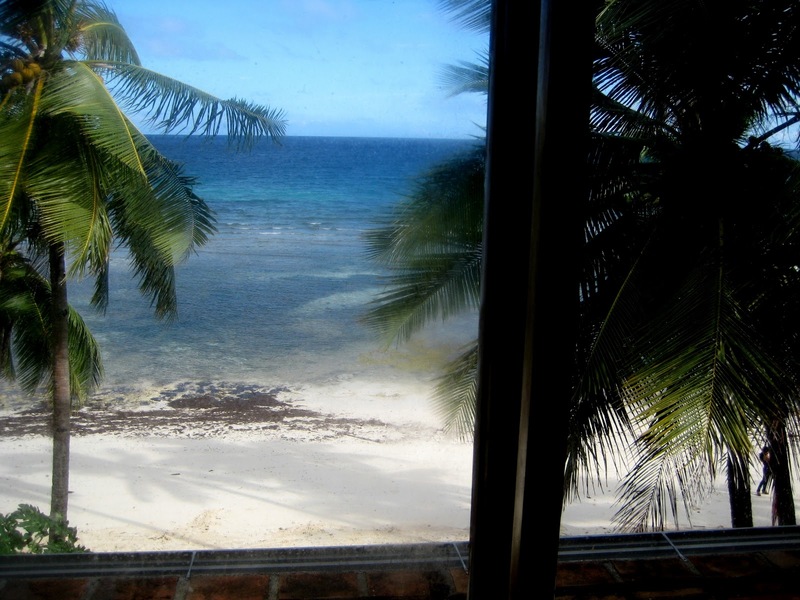 When i woke up the next day, this was the view from my room. (see above photo) I was in Awe! I sat at the couch for a bit, and admired this fantastic view. How i wish i could own a property with just a simple shack, and i will be happy. As always, i spent my late afternoons drinking SMB and watching the sunset. Sometimes, i sleep in the hammock, in the sand, or I'll grab a bottle from the restaurant with this view. But i always find myself walking and trying to catch the sunset. It's a feeling money can never buy. Dagman is a sporty guy, in the afternoon he plays tennis with just about anyone, at night he plays gate ball with everyone. Everyone is welcome to join the fun. The resort boasts of a tennis court with lights so it's possible to play at night. 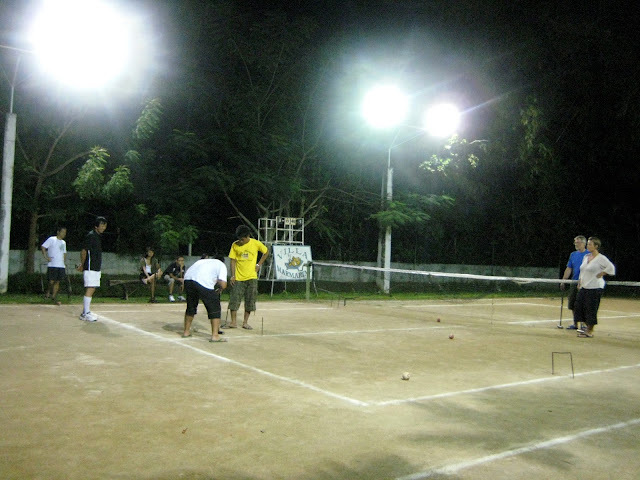 Tournaments are held here, finding the best tennis player in Siquijor. Ironically, Dagman and the other cool guy, Michael always manages to land as the the Siquijor Open grand champion or first runner up. Although i was asked to join, i just watched because as minutes pass by, the game gets complicated. i couldn't understand anything. ha ha. But it was good fun! After gate ball, most of the guests would gather round the restaurant table and chit-chat. Dagman would spend a few hours a night with all of us, and open bottles of grande SMB and Gold Eagle beers to cheers. Although restaurant closes at around 10pm, beers are available in the ref of your room so just grab one when you feel like drinking. Dinners are available when you want it up until 9pm only. Order as you please, you can pay right away or wait till you check out. At night, the lovely girls would dress up in kimono while serving you your feast, with fireflies (depending when they want to show off) as your guests and the sound of crashing waters as your music. Villa Marmarine is a gated resort with roving guards every night. Swimming is ideal during high-tide. When it's low-tide, you can easily spot sea urchins and broken twigs. There are no computers available for rent, but you can easily borrow Dagman's laptop. Wi-fi is readily available so tweet and Facebook if you want to. The resort personnel practices honesty system and cleanliness, as trained by the Japanese couple. Don't throw cigarette butts anywhere. I use old bottles of mineral water to dispose my ciggie butts when i hit the beach. Villa Marmarine isn't perfect, the shower system can be spotty as sometimes water can be too hot or too cold. Curtains are best advised to cover up the huge sliding windows, i didn't mind at all. It was the perfect set-up to a tropical hideaway. If i wanted to stay somewhere perfect i would stay somewhere else. But where's the fun in that? 2009 Edition of Lonely Planet features Villa Marmarine!! P1000-1400, P1400-1700, extra person P200; a new place on Siquijor’s north coast, has been an instant success through word of mouth alone. Run by an irrepressibly cheerful Japanese couple who have poured their personalities into their business, this is no cookie-cutter package operation, Daman and Marie Harada have even named three of their cottages after their children, which is just one of the reasons this resort feels so homey. But ultimately it’s the clever. Japanese-inspired design that makes it all hang together so well. Mezzanine levels, furo baths, wooden ceiling fans and self contained kitchenettes are so well arranged you’ll feel like reproducing it at home. The cottages are genuinely excellent value, especially for those travelling in a group or staying long term. Needless to say, there’s an on-site dive centre. Other pluses: it’s accessible to people in wheelchairs, and there’s free wi-fi. A habal-habal from Siquijor town to here will cost P30 and take 10 minutes. Should you plan to stay here, just tell them i gave you my referral. If you don't know me yet, i am Jerik! Thanks for all the tips. We'll return to this post kapag nagpunta ako sa Siquijor. To chill in the hammock and to watch as hours pass by, to pray and meditate. Pure bliss. I want to experience the same. The best entry. Thanks again for sharing this. 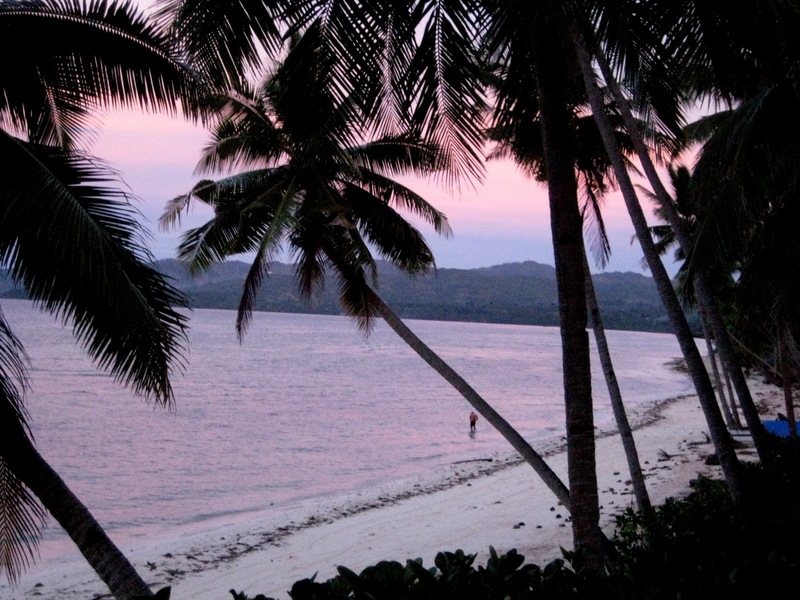 @thepinaysolobackpacker i highly recommend Villa Marmarine! siguro kaya lonely planet chose this resort as top pick. there were a lot of walk ins and would look for resorts nearby but they always come back to Villa Marmarine. the best spot to relax and unwind. rooms are rustic, the owners and staff are absolutely friendly, i felt like i was part of their family. hands down, the best resort i have ever stayed in. @pinaytraveljunkie he he the rooms cost from P700 up, depending on the size and number of people staying. siguro pag ako, kahit sa restaurant na lang ako matulog just to stay here! @Rizalenio Yes, punta ka ng Siquijor man. Like you who takes photos beautifully, the province is a photographer's delight. Yes, sa lahat di ko makakalimutan ironically eh yung wala akong ginagawa. Keep checking out my blog! By the way, congratulations on the lonely planet one world... you deserve it, galing! Sumali rin ako but i didn't win! Thank you for this post. Ive been searching the net for days for the perfect resort, and this seems to be the one! @Anonymous i highly highly recommend this place. i don't normally post all the guesthouses/hotels/hostels where i stay, only those which i can highly recommend to people like you. i am not promising anything, but just say Jerik recommended you to this place. tell Dagman or Flor or Max. It's probably the best resort I've ever stayed in the Philippines. Hey Jerick! I Just came home from a 3 night stay at Villa Marmarine. And everything you said were true- they have the friendliest staff in a resort I've been to. I was the only local guest that time so I thought they gave me extra attention. HAHA. I booked for a standard room for one but surprisingly when I got there, they made me stay at their deluxe room which is just beautiful. Thanks for always sharing. And hey, do you have plans of going to Concepcion, Iloilo? heard they have really nice beaches. Will go there by June. BTW, the resort is really silent. very calming and the best hideaway from the stressful life in the metro. I don't have anything bad to say. They have the best people. And at dinner, I am seeing fireflies by the tree. Also, they treat their guest fairly- either local or foreign. Can't wait to go back! @trisha_cerilles It gives me joy that you enjoyed your stay in Villa Marmarine. I felt like i never left home because Dagman and his crew treated me like their family. It's a total opposite of what i've experienced in a hostel in Dumaguete. Hope you can come back soon as i want to go back too. I've heard about Concepcion and good thing is I'm going there this June also. When will you be there? We might see each other on the road. Got a CebuPac Piso fare for Cebu- Iloilo roudtrip, so will take the opportunity to explore Panay in 8 days. Will also include Antique. And a trek to Igbaras. Your blog is just wonderful. 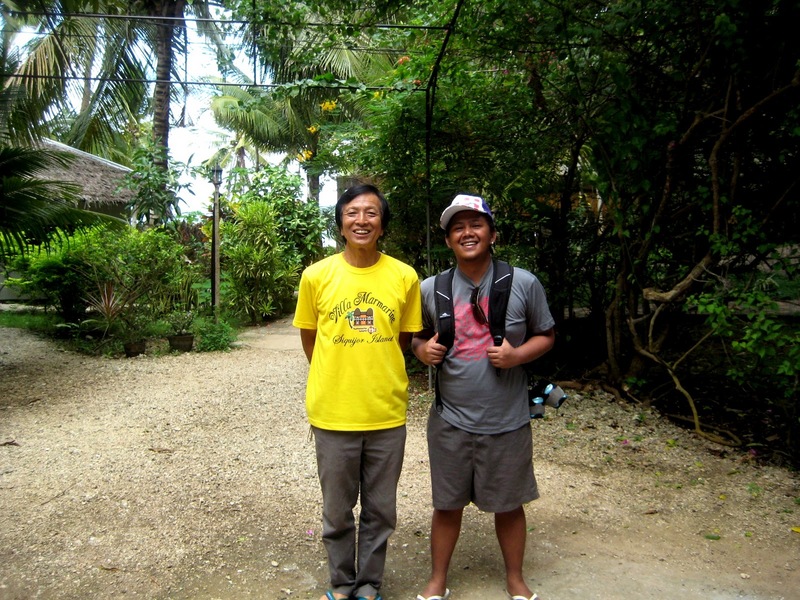 Very down to earth, and human :) Back to Villa Marmarine, yes will definitely go back. I won't forget the people. They're the nicest! Wow. The place is really cool. Is it safe out there? Because there are rumors with regards to the place. Awwww. you have awesome itinerary. I just wish i could afford longer time traveling. 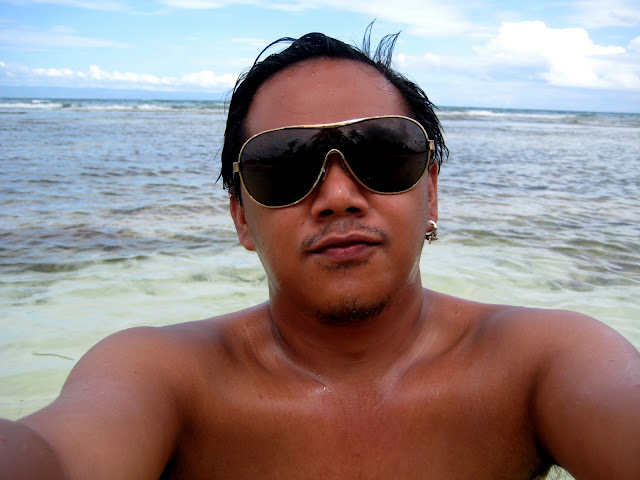 I love everything about Visayas!!! And yes, i wanna go back to Villa Marmarine. 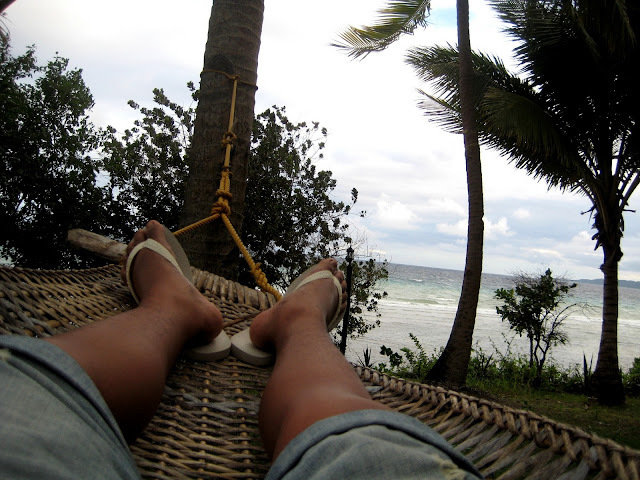 Because of how the people welcomed me, all of my inhibitions of Siquijor just faded away. Thanks Trisha! Let me know about your trip. My trip is on mid June back to where i first started traveling - Ilo-Ilo and Guimaras! 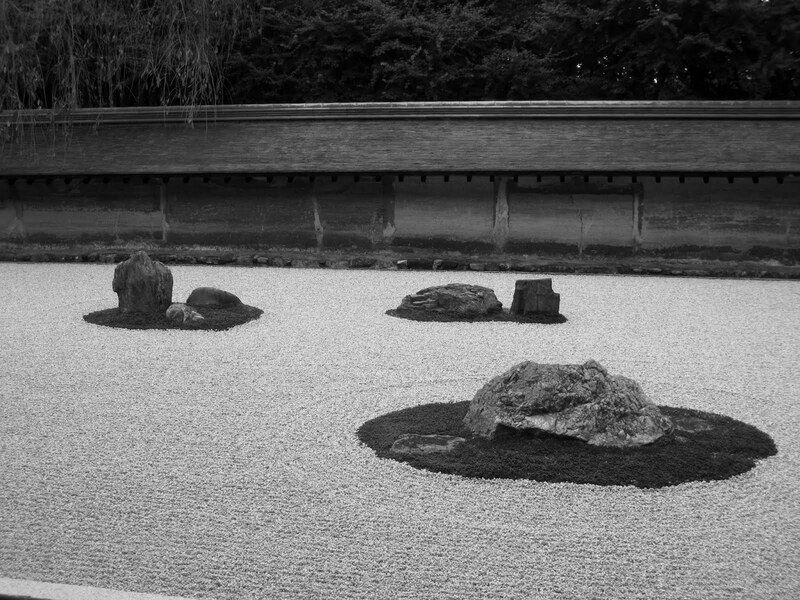 @Akiko Of course, there's about three roving guards whole day and night. So i felt very safe plus Siquijor is almost 100% 0 crime rate. everyone there is just so beautifully nice! i love the resort and the people. @trisha_cerilles yes thanks trisha!!! i want to read about your trip soon. do you have a page so i can link with you and read about your trips. have fun in Ilo-Ilo and Panay! that's it... we are staying here! @Ron when are you guys going???? 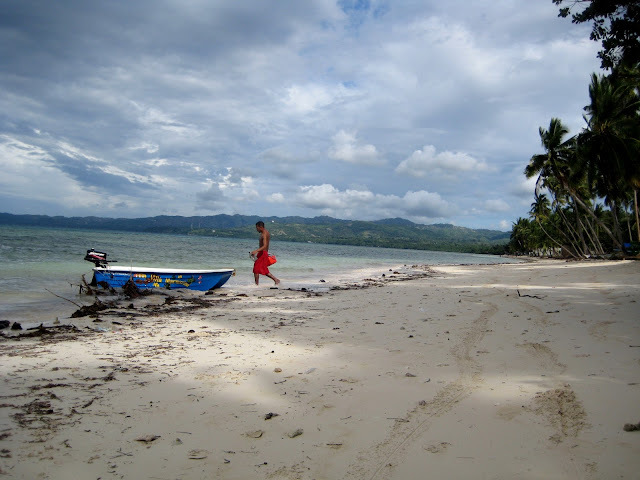 You will love Siquijor. Villa Marmarine is actually the best place i've ever stayed in the Philippines. :) Enjoooy! hi Pinoy Boy, we'd like to stay at VM, but seems like all the cottages have been booked, Dagman answered there's only a guest room for 2. Do have an idea what this room looks like? Sarap magbakasyon sa mga ganitong lugar. Yung hindi masyadong matao. The guestroom at Villa Marmarine is the one in the photo with 2 beds. Jay! Nakuha mo kaya favorite ko ang Siquijor!!! Hi Pinoy Boy Journals, do you have a contact number of that guy who drove you around Siquijor? how much did it cost you? Hi Anon! Sorry for the super duper late reply. Anyway, his name is Erwin and this is his number 09093255618. Hope the number is still working. Cheers!